This trail offers a very nice crossing of the Missouri River on the Page Avenue bridge and links up with the trail system in Creve Coeur Park. Click the following link for more information on the connector trail and Creve Coeur Park. The following map directs you to the Lake Rentals Center, on the lake shore. This round trip route takes the Katy Trail and the Boschert Trail and goes through Fox Hill Park to Rue Royale Street in New Town. When Eco Park opened in 2009, St. Charles got a great area for residents and visitors to enjoy nature and learn about conservation. This extension of DuSable Park consists of wetlands, river outlooks, and 3 miles of crushed rock and sand trails. This trip mixes gravel riding with pavement for an exciting and beautiful ride. You will ride the Katy Trail along the beautiful Missouri river, cross the river on a dedicated bike path and link to the Monarch Levee trail. 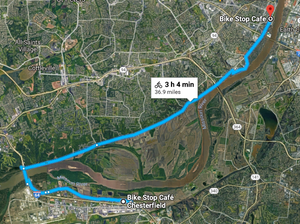 Take a break at Bike Stop Cafe Chesterfield before you return to Saint Charles. BSC Chesterfield is located at the center of Chesterfield Outlets mall next to POLO and Yankee Candle. Bike racks are located at the front of BSC. America's longest "rails to trails" project, the former MKT rail line, is a flat, scenic trail meandering over 225 miles from Clinton to St. Charles, MO. It's ideal for hiking, running, or cycling on just about any kind of bike. A popular travel destination, it's part of the Adventure Cycling's Lewis & Clark route as well as the American Discovery Trail. The Bike Stop Cafe hosts cyclists from all over the world as they check the Katy Trail off of their lifetime destinations list.